Gudja is a village in the Southern Region of Malta, with a population of 2,997 as of March 2013. The village is located on high grounds, south of Valletta. It is administered by the Gudja Local Council. A number of schools, clubs, public gardens and recreations places are found around the village. The Malta International Airport is located in the peripheries. The area has been inhabited since pre-historic times, evident from remains still in situ. Scarce Punic remains were found in an area known as Xlejli, within the villge. Several remains of the Roman period are scattered in the whereabouts, notoriously the Ħal Resqun Catacombs. The area was inhabited during the Arab and subsequent medieval periods, and the settling found today dates to the Order of St. John. The centre of the village further developed during the British period, after which a number of modern neighbourhoods were built. The village has a concentration of churches, some dating to the mediaval period, and other secular historic buildings such as Palazzo Dorell. Prominent buildings are now scheduled as Grade 1 or 2. Some buildings and a number of niches and statues are listed on the National Inventory of the Cultural Property of the Maltese Islands. Gudja means a land located on a higher ground but not a hill, with an approximately round peripheries. Gudja's coat of arms bears the motto "PLURIBUS PARENS", which means "Mother of many children". These children are Safi, Kirkop, Ħal-Farruġ, Luqa, Mqabba, Birżebbuġa and Tarxien, which at one time were all part of the parish church of Gudja. From Tarxien then, another three parishes emerged: Fgura, Santa Luċija and the Christ the King Parish of Paola. Then again, from the latter, another parish emerged: the Our Lady of Lourdes parish at Paola. Gudja was inhabited since pre-history, as evidenced by Ta’ Għewra site. Roman period remains are spread around Gudja, and the most prominent site, of this period, is the Ħal Requn Catacombs. The oldest, still in use, houses in Gudja date to at least 1533. A house built by this date is located in the whereabouts close to the main square. A Gothic inscription, with Sicilian influence and Greek letters, sheds history on this residence. Though the words in relief are largely unreadable, there are old photographs and documentation on the considerably unusual inscription. An unusual tower dating to 1780 was built on the spot of a possible Punic-Roman tower, in an area known as Xlejli. A palace, known as Palazzo Dorell, was built nearby and its garden has enclosed the tower within its grounds. The palace served as the headquarters for British forces under General Graham during the French blockade of 1798–1800. The Baroque parish church is dedicated to the Assumption of the Virgin Mary, and it is the only one in Malta with three bell towers. The most conspicuous of these is the non-symmetric Neoclassical William Baker Tower. The interior of the church is decorated with objets d'art. The titular painting is that of the Assumption of the Virgin, painted by Italian artist Pietro Gagliardi in 1887. The same painter was commissioned for the Our Lady of Mount Carmel painting in 1889. Another notable painting is The Death of Saint Joseph, by Italian artist Domenico Bruschi in 1894. The most important sculpture, inside the church, is the titular statue of the Assumption of Our Lady, sculpted out of solid wood, in 1807, by the Maltese Vincenzo Dimech. It is the oldest statue in the Maltese Islands when featuring the Assumption of Our Lady. Gudja is known for its 15th century Chapel of Bir Miftuħ. 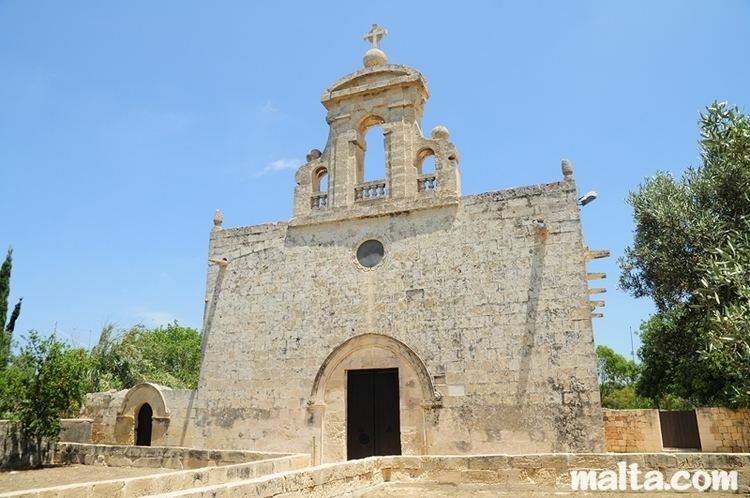 Bir Miftuh was already established as a parish by 1436, making it one of the first parishes on the Maltese Islands. The Chapel of the Madonna of Loreto was built in 1548 by Knight Imbert de Morine as thanksgiving for his safe keeping during a Turkish battle which took place in the area. It was probably built on the same grounds where an older chapel stood. The Chapel of St Catherine found at Raymond Caruana street, is a very old Chapel. This isn't the first chapel to be built on this site. The present Chapel was built in 1661. Presently this Chapel is used as a store for feast materials. The Chapel on the Annunciation is one of the three chapels that were previously built in this area. The present chapel dates to the year 1754. According to the pastoral visit of Bishop Bartolomeo Rull, the chapel was built on a Greek Cross plan and housed a cylindrical dome on top. The facade is plain with strategically placed architectural feats which donate its grandiosity. Flanking either side of the facade, there are two flat austere looking Doric pilasters which are topped by a blank entablature. The main portal is surrounded with a simple thin stone moulding with emphasis on the two top corners of the door. Above the door, one can see a finely executed triangular pediment with a small arch embedded within. Piercing the facade, there is a large ornamental window in executed in the Baroque style. This window and the square belfry on top are a later addition to the chapel and were executed by Anglu Dalli on the design of Carlo Farrugia. At the corners of the facade, there are two stone statues representing Saint Anne and Saint Joachim while on the belfry there is the figure of archangel Gabriel. These statues are the work of Antonio Zammit. The architect Girolamo Cassar, who is known for designing many buildings in Valletta, was possibly born in Gudja (although some sources state that he was from Birgu). Pop singer Madonna shortly resided in Gudja, during a visit to the island. Football Gudja football team known as Gudja United F.C.. The club enjoyed a successful period in the 1980s and in the 2014-2015 season when they narrowly lost promotion to the Premier Division. The last Local Council election took place on 9 March 2013. Each Local Council serves for 4 years. (Gudja also had a Youth Local Council in 2010/2011).